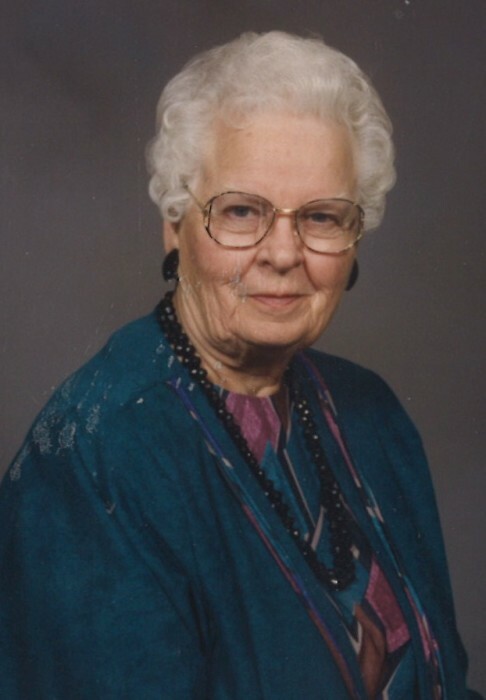 Ruth Anderson, 99, of Maquoketa passed away on Monday, November 19, 2018 at CrestridgeNursing Home in Maquoketa, Iowa. Her funeral service will be held on Saturday, November 24, 2018 at 11:30 a.m. at First United Methodist Church in Maquoketa with a visitation from 9:00 a.m - 11:00 a.m. prior to the service. Burial will be at Union Cemetery, Maquoketa. Lahey & Dawson Funeral Service Of Maquoketa is caring for Ruth’s Family. Ruth Rowine was born on April 1, 1919 in Maquoketa, Iowa to Henry and Nettie (DeGraw) Woods. She graduated from Maquoketa High School in 1937. She was united in marriage to Melvin Bentley on February 16, 1941. On October 25, 1965 she was united in marriage to Marvin Anderson. As a homemaker for the family she would also help her husband tend to their farm. She was a member of the First United Methodist Church in Maquoketa, Iowa. Knitting and Ceramics were some of her hobbies. She was also active in church making envelopes for the church for many years. She was a member of farm bureau as well as Mothers Club. She was still mowing her own lawn until she was 88. Those left to cherish her memories is her son; David Bentley of Maquoketa, grandchildren;Angela and Christina, ten great grandchildren, six step children and many step grandchildren and step great-grandchildren. She was preceded in death by her parents, two husbands, a brother Max, sisters Helen and Margaret and three nephews. Online condolences may be left for Ruth’s family at www.laheys.com.